Posted on 02/08/2013 by Stand and face the sun. I’m lucky that I have the opportunity to teach yoga on Friday evenings and that the people I get to teach are some of the most dedicated people I know. I always joke with them by saying I love my friday peeps way better the monday people, even though a lot of the time they are the same people. 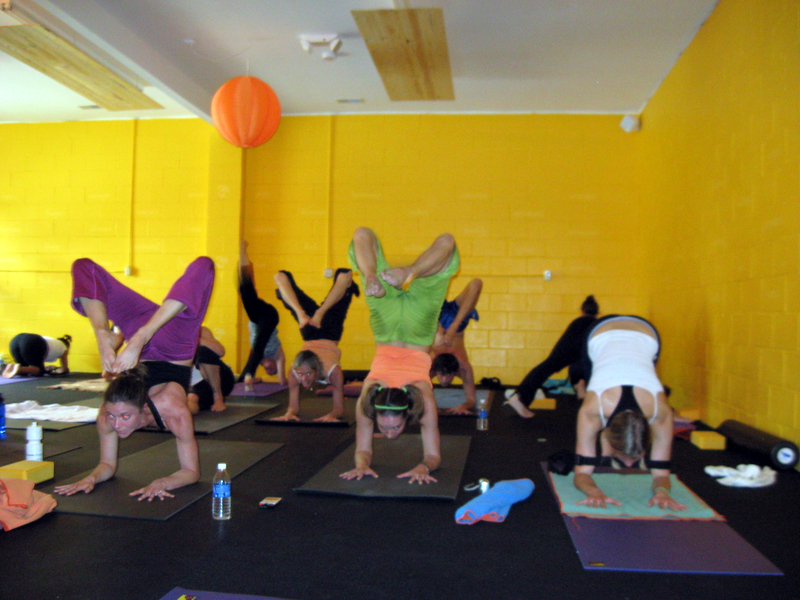 The friday crowd has passed on all other possible friday night invites, so they can get their yoga groove on. I mean, it is Friday evening after all, right? The class starts at 5:30 which seems to align with the assembly idea. They have to release themselves from work a little early so that they can assemble with their yoga satsang. We have so much fun in this class. By the end we feel united in the belief that yoga is a great way to start the weekend and a great way to let go of the past week. This group of people seem to support each other like no other. Second series at The Practice Space, March 2008. I’m sure we could look at the word assembly and see it synonymous with congregation, or a collective. That whenever you gather a large group of people together hopefully the undertone is that you realize you have something in common. Which naturally raises the energy vibration of such a gathering. I have taken many trainings with my teacher Tim Miller over the years. People come to his trainings from all over the world. I have practiced alongside people from Sweden, Japan and Australia, as well as Florida, New York and Oklahoma. By the end of these two-week trainings I’ve made many friends, comrades in the journey of ashtanga yoga. One idea unites us all. Once in the yoga room practicing together, we become like one gigantic lung, one breathing vessel. Creating prana for all of us to share. Prana is called the life force so when people make the joke, “Let the force be with you.”, it’s actually a true statement. In a mysore practice with 30+ other ashtangi’s, no-one is talking, there is only breathing and movement. Yet it feels like we are having a conversation. This must be the language of love. Our love for ashtanga yoga, is our unspoken language. No one is talking, everyone in the room is working hard, but yet there doesn’t seem to be a shred of animosity or jealousy, even though the skill level in ashtanga yoga can vary greatly. There just seems to be harmony. This is the same thing the football coach, track coach and school principal were trying to get us to embody at that school assembly. We are better united, then we are divided. We can get further when the company we keep has a unified philosophy. There is another interesting element to this type of gathering that I recently stumbled upon. I was picked to serve on a criminal jury trial. The experience was rather sad and depressing but ended up providing me many new insights. One of those was this: strip people of all their identifiers like suits, degrees, jewelry and coiffed appearance, and you realize that you can always find you have something in common with each other. As I was at the gym where I teach most of my yoga, a few weeks after the trial I noticed the prosecuting attorney, as well as the judges clerk, working out at the gym. What I realized was this… the gym is a great place to join people together even though in our outside responsibilities we are very different. As I saw the prosecuting attorney exercising in her plain white tee and black pants, I realized in this environment, we have no labels. We are all just congregating for our better health. In a yoga room there are no mothers, brothers, housekeepers, landscapers, lawyers, rich, poor, infertile, adopted, fashionable, smoker, alcoholic, and so on and so forth. It’s as if the playing field were leveled back to the most basic truth. Which is we are all human and we mostly all have the same parts. That without labels and identifying responsibilities we are equal. If your teacher is a good teacher, he or she has learned to teach a great class, no matter the reason that each student is there. They shouldn’t teach a better class to a lawyer, than to a housekeeper. You don’t favor the tall over the short and you don’t draw attention to the mother, over the motherless. We are a satsang; a community of people who ultimately agree that yoga is good for us. Which is why each person wakes up in the morning and packs their bag with yoga clothes and a mental commitment to get it done, whether they struggle or float gracefully thru the sequence, whether they can do headstand (sirsasana), or sit in lotus (padmasana), whether they can stay the whole hour and a half, or just an hour. Take off the make-up, the fancy or ragged clothes, jewelry, pull back the highlighted or dull hair into a ponytail, with your beach towel or your yogi toes, no phones, no degrees, for the most part no apparent differences, and no openly different opinions (no doubt the opinions and labels vary widely). These things aren’t necessary to practice, you never need to know them. All you know is the person to the left of you wanted to do yoga today. The person doing backbends behind you, wanted to do yoga today. The person taking early savasana, wanted to do yoga today. So yoga has done it’s job, it has united us, yoked us together. It has assembled us, in more ways than one. We have congregated under the same roof, under the same sun, and under the same belief that yoga is good for us. Wether practicing in Japan, Portland or a tiny town in Boardman, Ohio, yoga works. If you have ever wanted to be apart of something that has no prerequisite, this is it. You can be a Democrat, Republican, Buddhist, Episcopalian, third child of eight, high school drop-out or cancer survivor. All accepted and invited, no questions asked. Really. The only underlying question is “Are you willing?” Because when you are “We are all in this together.” We are all the same.